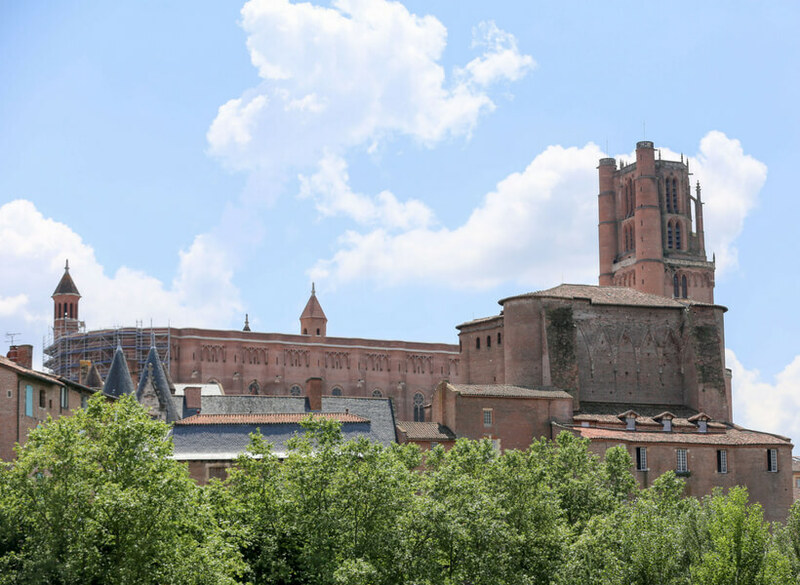 What Should you See in Albi? Albi, in Southwestern France, home of the world-famous Toulouse-Lautrec and the Cathedral Sainte Cécile, which is said to be the biggest brick building in the world. It has a wonderful southern climate and hospitality and has a lot to offer. Albi is a world heritage UNESCO site. What does that mean? The list of UNESCO sites started in 1972, and it was created by committee as a way to preserve a building, or geographical location, or–as is the case with Albi–the whole city center. These are places that need to be preserved for their cultural or natural beauty. Every year, different countries present the places they would like to list as candidates. There is a rotating committee of twenty one member countries who review the applications. There is an exhaustive process where they go over the qualities of the place and see if it meets rigorous specific conditions. Albi is in the department called the Tarn. France is divided up into departments and regions. In episode 18 we talked about the city of Strasbourg in the region of Alsace. Historically it probably had a Duke, or a Count, or a King and it became part of France at some point. The Tarn is a department and not a region. It would compare to an oversized County in the US. France is divided up into 99 departments although several of them are outside continental France because they include places like Martinique and Guadalupe. These are administrative divisions that were were created after the French revolution. The name of the department is usually derived from its most prominent geographical feature. In this case it’s the river Tarn. The Tarn is a big river that eventually flows into the Garonne River almost at Bordeaux and the Atlantic. Albi is the main city in this department and it has about 54,000 people. 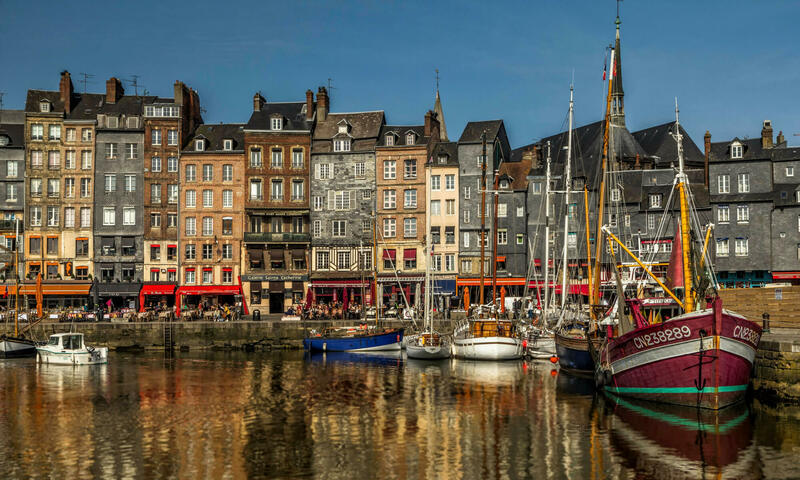 But in terms of the way people live in France, remember that this is a country of thousands of small cities. It only has very few big cities. Most French people would say Albi is definitely a city. It has over 50,000 people. It’s an administrative center for the department, it has a university, it has a lot of high-tech moving into it, and it is extremely proud of being a world heritage site. 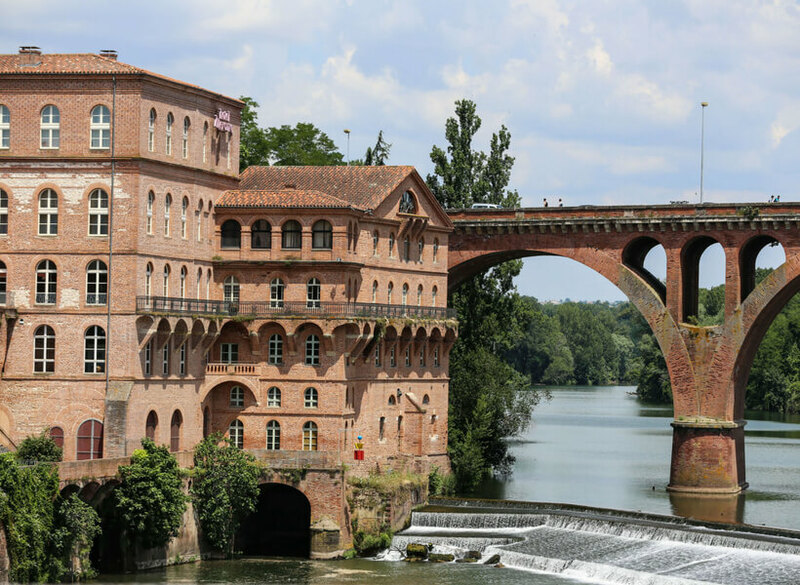 Albi is not to be missed in the Southwest of France. It is accessible mostly by car or train as it only has a small airport. The countryside around LB is mostly rolling hills. The city is built on the river. The city is famous for being made almost entirely of a magnificent red/orange brick. It is the building material exclusive to a certain area of the Southwest of France. That break is also found in Montauban, Toulouse, and small villages in the area. Is it more orange or red? It depends on how you define the colors and how the light hits the brick. Many people who visit the area think it’s like Tuscany. Albi was not the city of great importance centuries ago. It was part of the medieval world, but it was mostly agricultural. There has been settlements with people in the area for many centuries, but it was never a major center for commerce. During the Middle Ages it was known as a scriptorium. Monks did most of the writing in those days. During the dark ages many advances came to a halt, but monks continued to preserve knowledge. There used to be a very large monastery up on the hill where the center of Albi now is. It no longer exists, but we know for a fact that it was there. The monks used to copy documents before there was a printing press. Mostly it was religious texts but not always. 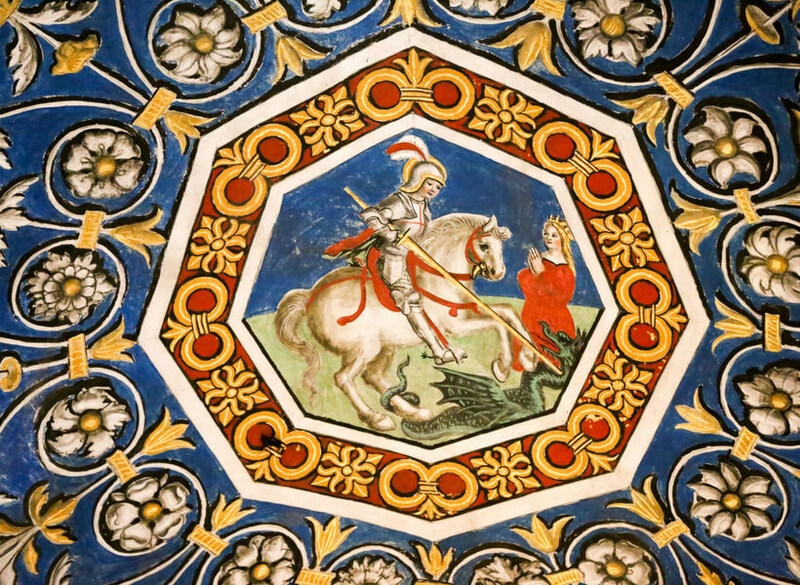 They sometimes used illustrations and that’s what we call today and illuminated manuscript. Few people today still know how to write in script, but in France children still learn that skill. 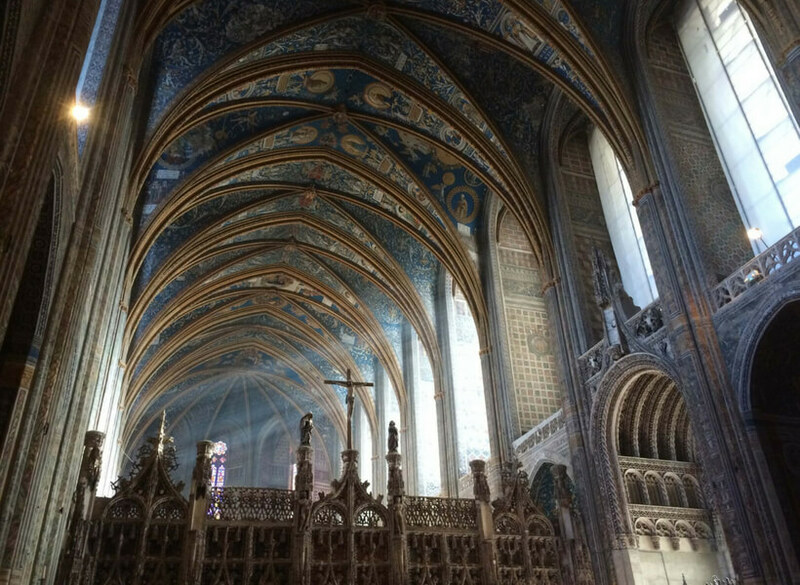 In the 1300s Albi became more important because of the building of the Cathedral. Usually they put cathedrals in places where there are already a lot of people. But with Albi it was the opposite. They decided to put a Cathedral there for reasons other than population. The popes in Rome decided that it would be a good place to put a Cathedral where they could rally the people. The city was built around the church and not the other way around. So we can say that they put the cart before the horse and it worked. They spent a lot of money and resources on this Cathedral, but it looks very different from anything you will see in the north of France. It is more like a fortress than a Cathedral. The word fortress is very important in this context. The War Against the Cathars The Cathedral of Albi has a lot to do with the religious conflict between the Roman Catholic Church and the Cathar’s movement. A religious war between the two took place in the 13th century. The Roman Catholic Church had its own military and they were faced with groups of people who were embracing a new religion. This is not Protestantism which came later, the Cathars were much earlier. The Cathars were a new Christian religion and many people in the Southwest of France were leaving the Catholic Church to become Cathars. Unfortunately for the Catholic Church, it was not only the peasants and the simple people who were leaving the Catholic Church to become Cathars. People used to give enormous amounts of money to the church and it was very wealthy. It was the church that was telling the Dukes what to do. But there were many lords and ladies who were moving towards that new religion and it became a big threat to the Roman Catholic Church. So, for a period of about 30 years there was a war which we can consider to be a civil war in the Southwest region of France. This war was eventually won by the troops of the Roman Catholic Church in conjunction with the troops of the King in Paris. At that time the King of Paris was not the king of the south. in the Southwest of France you can visit Cathar Castles, they are usually perched up on the hill, and there is usually not very much left of them. It’s pretty clear that they lost the war. Visiting those castles makes for a good hike. At some point Join Us in France will do a podcast episode about the Cathars because it is an interesting subject. It would be interesting because of the history, but also because they had a very interesting theology. There are no Cathars today as far as we know, the religion is extinct. When this religious war ended two major things happened. One has significance all over because all of these lords who lost had to sign over this entire region to the French King in 1279. So Southwest of France became part of the kingdom of France starting in 1279 as a result of the Cathars losing their war against the Roman Catholic Church. And at the same time they begin to build this incredible Cathedral in Albi. The Cathedral is named after the patron saint of music and musicians Sainte Cécile. If you’re in France on the day of Sainte Cécile (Nov 22) you will find a lot of choir concerts and special events having to do with music, a lot of free concerts given in churches by local choirs. They began building this church in the middle of the 13th century. It’s important to know that Albi, much like the rest of the Southwest of France, has a lot of clay. And clay is used as a basic building material. They chose to build this Cathedral out of clay brick because there are no stone quarries nearby, so stone is terribly expensive. This Cathedral is a humongous it’s 110 m long and on top of the church spire it is 78 m tall. It is massive and the word fortress is totally appropriate for it. It was designed to be that way. Side story: there is a lot of clay in this area and in most places you can go at least 10 m deep until you hit any rock. And that means that houses that are built around here tend to shift. If you want to avoid the shifting you have to build your house on pylons that are dug 10 m deep, if your house rests on clay, we know that clay expands and retracts and causes movements. Brick making techniques were introduced by the Romans 2000 years ago. One of the advantages of building places at a brick is that you can make the brick right there in portable ovens for firing the clay. To this day we call the brick that we have around here Roman brick. It’s a very different kind of break than what you see in either the United States or in the north of France, where you see brick that’s more similar to what you see in England. The brick in the Southwest is thinner and has a bigger surface. There was the mandate given to make Albi the center of a new bishopric, and they wanted to bring people back into the church. Most people reconciled with the fact that the war was over and if they wanted to get on with their lives they need to go back to the Roman Catholic Church. As long as there was some sort of admission that things had to be a little bit different. As a matter of doctrine, they wanted the outside of the church to look very austere and would look like a ship or a fortress with a prow. It was designed to give the impression of strength, simplicity, and leadership. So they made church that was austere, monumental, impressive. 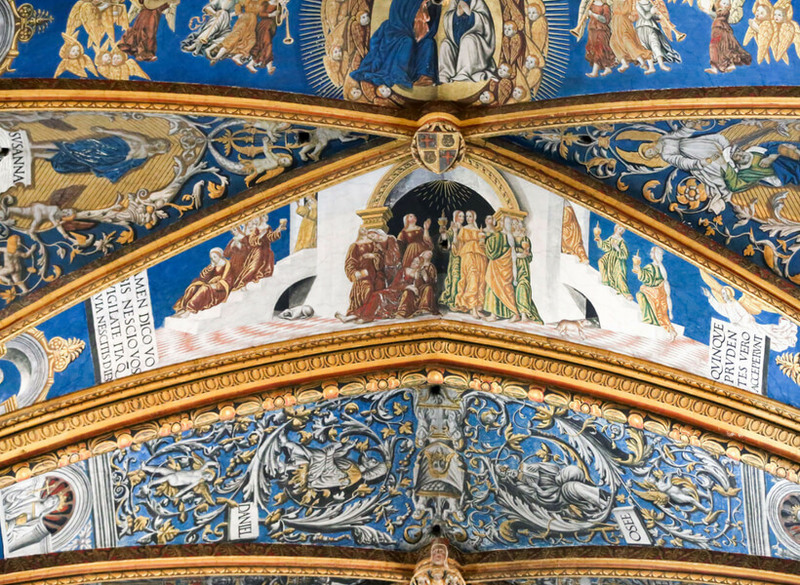 And in contrast when you entered the Cathedral of Sainte Cécile, you are overwhelmed by the color, by the painting, by the decorations everywhere. Visitors have one of two reactions: they either love the inside or they think it’s overdone. The ceiling is over 30 m high and was painted in fewer than four years which is remarkable because it’s over 99 m long. When you go inside of Sainte Cécile the color that you see is the original. They have never been blackened by soot because it’s so high up, and is known as Lombardi blue. Blue gold and silver are the main three colors. It is a magnificent blue. It’s like a sky but prettier. It tells the story of the New Testament and the Old Testament from one end to the other. 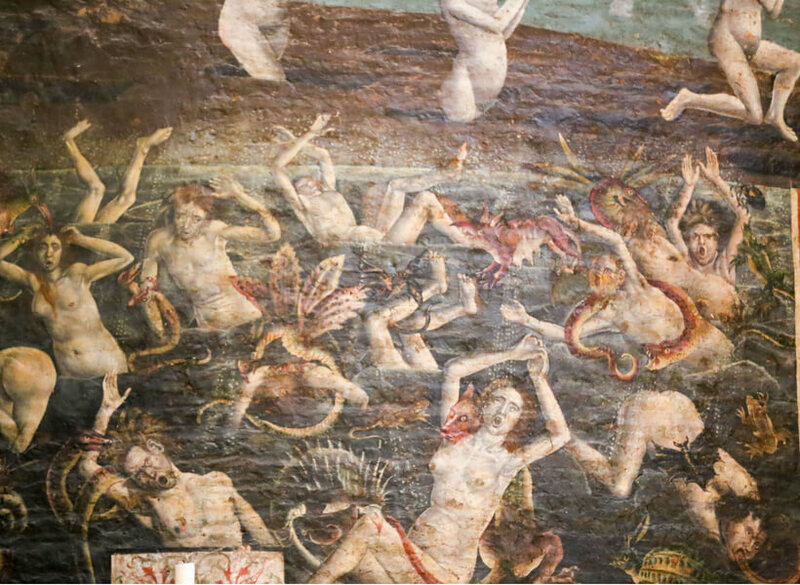 There’s also a famous painting of the last judgment, there are lots of little devils, it’s quite gruesome. 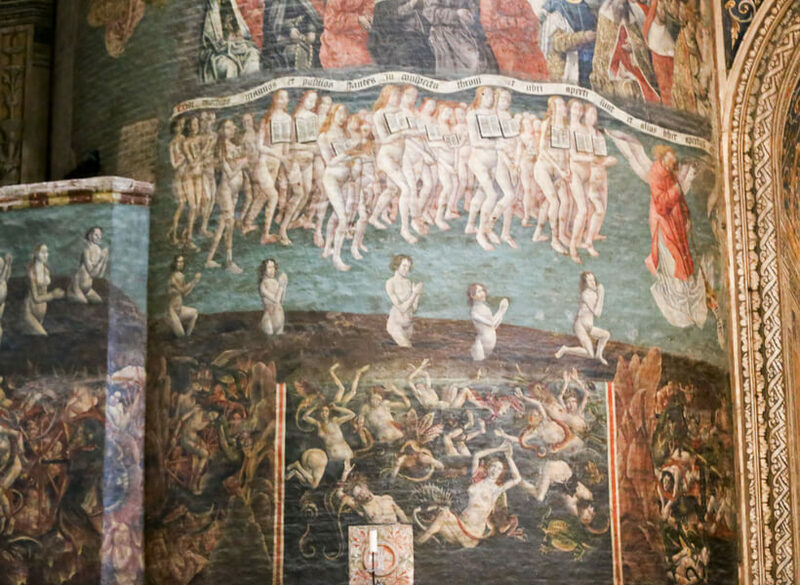 It is considered to be the largest painting of the last judgment in any church in France. It shows what happens to you if you commit one of the seven deadly sins. But there is a gaping hole in the middle of this large wall, and there’s a reason why. The mural is painted directly on the brick by the way, the whole church is only brick, there are no fillers. The walls are over 2 m thick, the buttresses are not flying buttresses, but they are up against the wall, and it’s nothing but brick everywhere. True story: there was a new Bishop in the 16th century who decided he wanted to have a chapel open up underneath the church tower. There is an open space back there that used to have a secret door to get into, and in order to do that he had to cut through this wall that was 2 m thick, right in the center of this incredible mural of the last judgment. And so, there is a piece missing. So if you look at the mural left to right, you see the people who are going to heaven on the right side, and the people on the left are going to be going to hell. It is very lurid, very graphic, and very clear what will happen to you after they look at your book of life which tells the story of what you’ve done. And they have all these people standing there naked with their book in their hands will look like they’re saying please can I go up to heaven? And on the other side you see the people want to go down and you see the devils and creatures were basically sending them into boiling pots. It lists in old French the names of all the different sins. Can you believe that this Bishop cut up this marvelous painting by Flemish artists just so that he could have a chapel named after him? The other thing that is very famous in this Cathedral is the choir area. There was an area that was closed off by something called a rood screen. In Sainte Cécile it is made of magnificent carved limestone. His made in flamboyant Gothic architecture and it is something that started in the 1400s. It was used to divide the space inside of the church in half so that one side of the church is available for townspeople to come in for services, and the other half is designed to house the monks. And inside of this space the monks sit and sing into their own services, but they are not to be seen by the townspeople. So the choir area is aptly named for a place where the monks sang and Sainte Cécile being the patron saint of music (Sainte Cécile is not from Albi, she was born and died in Rome) because the story says that the angels sang in the harps played. Renaissance Sculpture You have to pay two euros to go and see inside of the rood screen and there you will see a collection of Renaissance sculpture that is one of the most complete and rarest of all of France. Renaissance sculpture is different from sculpture from earlier times because the features are very realistic. These are poly-chrome which means that there are several colors on them. It’s all limestone, the sculptures are not full-size, but they are so realistic, they’ve never been fixed or touched up. 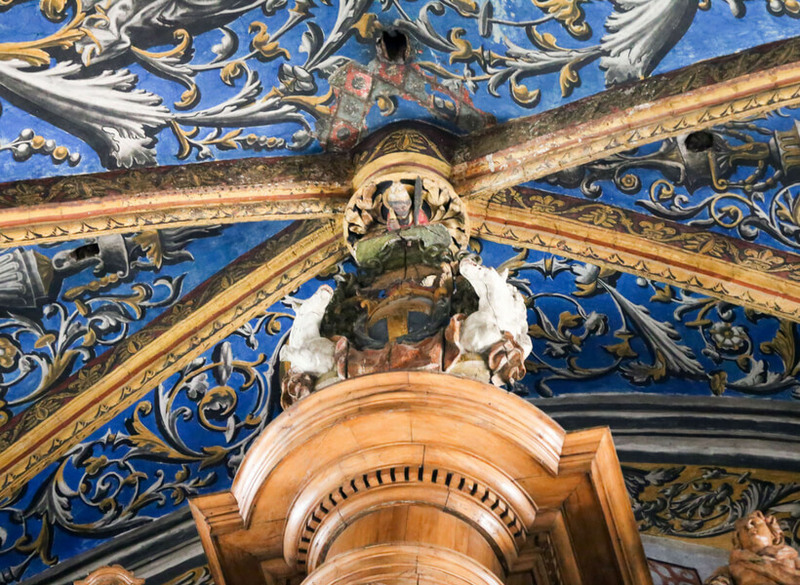 Some of them have a few chips, some of them could use a little bit of dusting, but they are one of the reasons why this church is considered to be a work of art. It’s not the building in and of itself, even though it’s very impressive. It’s that they brought in artists from Italy and Flanders and northern France and each one of these groups of anonymous artists did work that is unique. All of the work in the church is the original. The church was built in the third part of the 13th century, however the decoration inside the church is on the very end of the 15th century, starting in the 1490s. It took that long for the church to be built. The ceiling was done between 1500 and 1504. So the inside is Renaissance. Sainte Cécile is a wonderful place to visit and go listen to a concert, there is a large organ, and there many times in the year where they offer concerts inside the church. The Cathedral of Sainte Cécile receives a lot of visitors and they have started to regulate traffic inside. This is never a problem for small groups or single visitors, but if you visit with a large group you will have to follow certain patterns. The cathedral is always closed to large groups of visitors during religious ceremonies. Tour guides are required to use microphone and headsets in order to cut down on the noise. Remember that there are dress codes inside of cathedrals, for instance short shorts and tank tops are never a good idea, even if the church does not enforce the rule strictly. Sainte Cécile is Southern Gothic style, there are no side aisles so you cannot circulate discreetly. It’s one massive open space. During the summer months the Cathedral is open all day, but during the rest of the year it closes between 12 and two like most other buildings in France. The construction of the bishop’s palace started 20 years before the Cathedral. Bishops at the time were almost always noblemen, they always had a lot of money from their own families, but they also gathered the tide and they could decide how to spend that money. This palace was built near the old church that used to stand where Sainte Cécile is today. The oldest part of the city of Albi was fortified along the river Tarn and when they built the bishop’s palace, they incorporated a part of the fortification wall into the new construction. This palace was built over time. The first part looks almost feudal and little by little they added different wings to the palace. There are two small courtyards. Over time the bishops add sections to the building that look more like a northern palace with a round towers with slate roofs, the sort of architecture that inspired the Disneyland castle. Then a Bishop in the late 1500s added a small French garden (it is manicured geometric garden). Then he decided that the ramparts were not needed anymore and he turned the ramparts into a walkway, and you can walk on the ramparts today. From the ramparts you can see the river and a very old Bridge from the 1100s. That old Bridge has been reinforced so that cars can go over it. From the ramparts you can also see the “new”part of Albi which started in the 1400s. When you go to Albi do not miss that little walk around the French gardens and the ramparts. This Museum homes the largest collection in the world of works by Henri de Toulouse-Lautrec. The artist was born in Albi. He was the descendant on both his mother and his father’s side of the counts of Toulouse. His mother was a countess, his father was a count, they were first cousins which is unfortunately probably one of the reasons why he had so many health issues. Toulouse-Lautrec was crippled starting at the age of 16 and he died at age 37 in 1901. He died in his mother’s arms in one of the Château’s that is family owned in the Southwest of France. He died of a combination of alcoholism and syphilis, and he had been very sick starting in his early 20s. There was a suspicion that he got the syphilis from his father although we know he also frequented prostitutes himself. His father was a very strange man, he was a gentleman count who did nothing with his life but have fun. His mother had already had a couple of stillborn babies, so she decided to give birth in the city of Albi rather than at one of the Châteaux. So in the 1860s she came back to Albi where they owned a townhouse, and that is where Toulouse Lautrec was born. There’s a plaque outside that indicates that’s where he was born. Henry de Toulouse-Lautrec grew up in various Châteaux that his family owned, he loved horses, he loved to draw. He was a gifted young man. He took lessons but was considered to be a dilettante because he was going to grow up to be a count, and counts don’t work. At the age of 16 he had two accidents. In the first one he fell off a horse and he broke a leg, but it wasn’t a simple fracture, he shattered the bones in one leg. He was treated for it and started to walk again but with a very bad limp. The doctors knew about the disease called glass bones and one of the doctors suspected it. A few months later, he fell again, this time in the house and broke his other leg in the same way. At that point the doctors realized what was wrong with him, but they didn’t have any way to treat that. The doctors told him and his parents that his legs would never grow again. We put a picture of him on the website joinusinfrance.com/20 where you see that he looks very disproportionate. He was normal sized from the waist up, but his legs were very short. For the rest of his life, he could walk with the use of canes on each side, but he was always in pain. Because of this, at the age of 18, he did something that he shouldn’t have done. He didn’t have a good relationship with his father, but he was close to his mother. His mother supported him through everything. Toulouse-Lautrec decided he would never be “normal”, he would never ride, he would never be a Lord, so he decided to dedicate his life to his art. His mother gave her blessing because she knew we had this talent. The family was wealthy, his mother supported him financially, he never had to worry about selling his paintings. So he went to Paris to Montmartre, and he started to hang out with the artists there. It was a bohemian place, the place where the cabarets were, as well as the writers and the painters. Henry de Toulouse-Lautrec was interested in humans. As miserable as he was in terms of his own body, and as unhappy as he must have been, because he literally drank himself to death, he loved people. The vast majority of his work, aside from a few paintings of horses and the countryside, are people. He painted the people in the cabarets, he painted his mother whenever he went back to see her which was very often, he painted his best friend who was also his first cousin. This cousin stayed with him and was with him on the day he died because he was a doctor. There’s one for painting of this cousin/doctor in this collection. Most of his life Toulouse-Lautrec produced work that was not recognized. He was rejected because the subject matter of his work was prostitutes, poor people, dressmakers, hat makers, cabaret dancers. He was interested in regular people and also the underground. In the 20th century this was like Andy Warhol’s people. He was showing prostitutes and drug addicts, but they were also people who were artists, writers, poets, and this was his world. The other artists appreciated his work, but the public did not like his work. The public did not understand it, the considered what he did to be scandalous, so he didn’t sell paintings except to other artists. He didn’t need the money, but he wanted recognition, just like any other artist or person. Ironically, in the last 10 years of his life, so from the age of 27 on, he became famous little by little. But it was not for his paintings which are absolutely magnificent, but rather for his posters. One of his friends who owned a cabaret, and who saw the kind of work he was doing, asked him if he wouldn’t do him a favor and make a poster for his cabaret. Up through the end of the 19th century advertising was either in magazines and catalogs, or walls and pillars were plastered with posters all over the city. In Paris there are designated spaces on circular pillars there just for posters, advertising. But, until Toulouse-Lautrec and another Tchech artist, a man named Mucha who also lived in Paris the two of them changed the nature of what a poster was. Up until that time, posters were lots of words, and no illustration. Toulouse-Lautrec revolutionized posters by making it almost all illustration and a minimum amount of work. The name of the place, the address, and if necessary the dates of a concert or special event. He created these incredible images that were a little bit stereo typical, but they were fun and very dynamic, and people started asking: who makes these posters? In his lifetime, he created over 35 of these posters, some of the preparation work for these posters is included in the Museum in Albi, and he became famous for these posters. It must have been ironic for him, because what he wanted to be famous for was his painting and is drawing, but it revolutionized posters. In style, the paintings and the posters are similar. But for the posters he was using lithography (which is a whole process of reproduction) and by the end of his life they were able to take some of these and do photo lithography reproduction. When you see one of his posters and you see one have his paintings, you can tell it’s his work. There is no contradiction between work he did in paintings in the work that he did in posters. You see one of them and you will recognize it as a work by Toulouse-Lautrec, he had a very distinctive style. But what he did do is he revolutionized modern advertising by eliminating everything except for the bare necessity for information, and making it simply a dynamic image. there were two things that influenced him, and it’s very important to understand his work. The first is Japanese art. In the second half of the 19th century a lot of artists in Paris, which was the center of art, discovered Asian art in a very strange way. Objects were being brought back from China and Japan, and they were wrapped in paper. A lot of these objects were ceramic and wrapped Japanese local newspapers and magazines. In Japan they had developed a fabulous technique called woodcut starting in the middle of the 18th century. Artist would make these beautiful things that were printed in magazines, and in the paper will be used to wrap the ceramic. So what cuts were discovered in France by unwrapping ceramics from China and Japan. These woodcuts really caught people’s attention in Paris. Toulouse-Lautrec was one of the artists who loved the woodcuts prints and he used this is inspiration to change the technique of what they were doing. The technique is the question of composition and color. Toulouse-Lautrec gave recognition to this major influence in his work by changing his signature. When you go to the Toulouse Lautrec-Museum in Albi you will see that after a certain time he changes his signature to a Japanese character. By the time Toulouse-Lautrec dies in 1901 his studio is filled with hundreds of paintings, thousands of drawings. For the most part his mother inherits all of this work. She visited all the museums in Paris to see if they would take the collection. Every single Museum in Paris turned her down. They said this is a vulgar, this is not art would like to have in our museums. So she goes back to Albi and she’s desperate for a place that will display her son’s work. She goes to the local small municipal Museum of Albi. She lets them know that she is the Countess of Toulouse-Lautrec with a very long name (“de ceci de machin de bidule”) and she makes a deal with them. If they will house the collection, she will pay for the upkeep as long as she lives. Starting in 1905 the Museum in Albi takes on the Toulouse-Lautrec collection. For the most part this Museum is completely dedicated to Toulouse-Lautrec. There are a couple of small rooms, that are not. One has prehistorical objects and the other with some contemporary pieces. This Museum went from being an old musty museum to now when it’s a modern open Museum, air-conditioned, which is important because Albi gets very hot in the summer. On one for you have all of the work that has to do with the posters, on another floor it’s paintings and drawings. It’s a large Museum looks very modern on the inside, but they kept the old medieval walls. This Museum is now a very important part of any visit to Albi. The way the Museum was organized previously, things were in chronological order so that you could see the evolution of his work. Today some of the rooms have chronological order and some of them don’t. If you don’t go with a guide like Elyse and you want to understand Toulouse-Lautrec’s work, you should take the audio guide. Save time and energy for the part that has to do with the posters, it is very interesting. Warning: a pet peeve of Elyse (bête noire), they spent millions to remodel this Museum but there are only bathrooms in the basement even though there are three floors to this building. To get to the bathrooms, you have to take the elevator and go back to the reception area which can be time-consuming. There is a wheelchair access. How Long Should you Spend in Albi? A half a day is adequate for Albi. The Museum in the church are not to be missed, and then there are two or three other beautiful things to see. The old city center is very beautiful but very small. It’s lovely to walk around, there are some nice shops. Albi is a lovely place to have either lunch or dinner. There are lots of nice restaurants, some of them right across from the church in the Museum. There are higher-end gourmet restaurants. So you can spend three or four hours on visiting the city, and then have a nice meal. Albi does not have a specialty dish per se. Just like the rest of the Southwest, there are specialties with duck. They have a specialty pastry with almonds inside. They do very nice pastries, macaroons, things like that. On the Esplanade in front of Sainte Cécile and the Toulouse-Lautrec Museum there is a branch of the famous Chocolatier from Cordes-sur-Ciel called Thuriès. There are a couple of very nice wine shops also. Gaillac wine is produced nearby. In relation to the size of the city, it’s a splendid place to eat. From the beautiful French gardens with the view over the river you can walk down the road that leads out from the church in the Museum, it’s a beautiful downhill curving road that takes you to the old bridge. It’s a lovely thing to do because if you walk onto the old bridge you get a splendid view of both the palace, the Cathedral, and the old city. So you have this dense area of beautiful half timbered houses and Renaissance palaces. There’s also another church you need to take a look at, at least on the outside, it’s called Saint Salvi. It predates Sainte Cécile, there used to be a monastery there, there’s a little bit of cloister left. It’s hidden away, you have to go up the staircase and onto a courtyard. It absolutely splendid, from the 1100s. It’s a quiet little place where the gardeners plant beautiful flowers all year round. Saint Salvi is not very interesting insight because it has been redone too many times. The church tower is built with three different styles and materials. It shows the heritage of the 1100s, 1200s, and 1300s. It’s like a layer cake, they put one part on top of the other, they change the style. The lowest level is made of stone, the second level is a combination of brick and stone, and the top part is all brick in the later Gothic style. In France, when it comes to building things like castles in churches, they don’t raise it to the ground and start over again, they just add something else. So what you’re looking at is the transition of three centuries and three styles. And it’s the only building left like that in the center of out be. In half an hour you can walk around the old city center, you can see some of the beautiful half timbered houses. 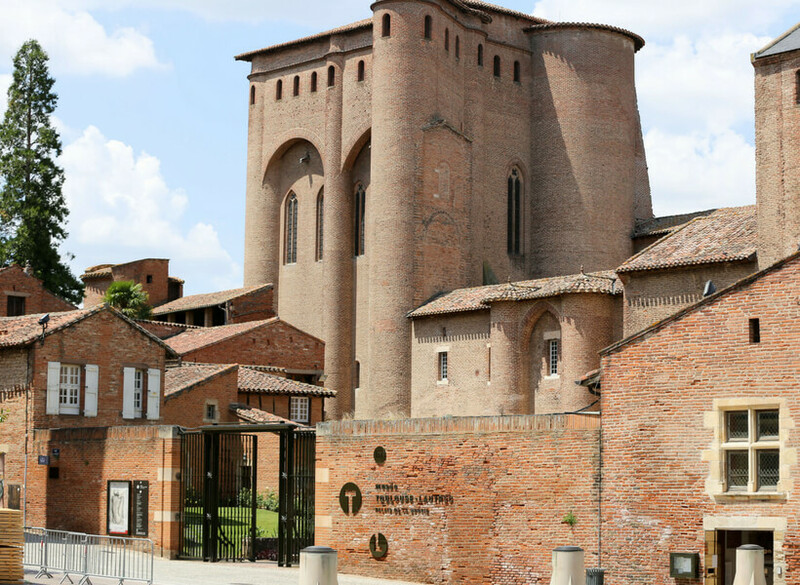 There’s a small space called the Old Museum of Albi, it may not be worth visiting, but it’s beautiful on the outside. You also have a couple of Renaissance buildings. One of them is the mayor’s office and the other is the Chamber of Commerce, they have courtyards that you can walk into except on Sundays when they are closed. If you walk around that area, which is really not very big, it gives you a good idea of what this area was like in medieval times. Albi is so beautiful that once you’ve been there you will never forget the city. Now that they fixed it up, they built all the walkways and the large Esplanade, it’s even nicer to visit. And they haven’t made the restaurants more expensive as a result, at least for the moment.